Savvy road warriors know you can find USB-charging cables for many portable devices—iPods, iPhones, Bluetooth headsets, game systems, you name it—and then charge those devices by connecting them to your laptop’s USB ports or to a “universal” USB charger. (Some vendors even make portable surge protectors with built-in USB-charging ports; I've covered such devices from Belkin and Kensington.) But many laptops don’t supply power to their USB ports if the computer isn’t on and awake, and a USB charger is just one more thing to carry. 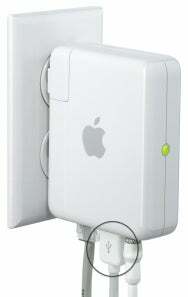 If you regularly bring Apple’s AirPort Express Base Station on your travels—say, to create a wireless network in your hotel room—this tip on Mac OS X Hints suggests a clever dual use for the Express: use the Base Station’s USB port, officially designed for sharing a USB printer across your network, as a USB-charging port. Just plug the USB cable for your iPhone, iPod, or other device into the Express while you work (or sleep), and the gadget will be ready to go the next morning.